On a wet, cloudy day in Cox's Bazaar the cast and crew of the film Jago struggle to fight the bad weather and stay on schedule, come rain or sun. Numerous umbrellas pop up as between the scenes, the actors playing the roles of the Azad Boys Football Club in Comilla run for cover and a man patiently touches up their make up. A group of crew members stretch a plastic sheet over the camera, as a sort of makeshift raincoat, eventually discarding it and getting a bigger umbrella. They are surrounded by washed up shampans, leaning this way and that, untouched by the crew members because 'they add value to the shot.' Wearing a green raincoat, the director and writer of the film, Khijir Hayat Khan, is standing to the side talking to a group of actors. His forgotten glass of tea, still in his hand, is watered down by the drops of rain falling in a drizzle all around him. As he finishes his pep-talk they start the shot. 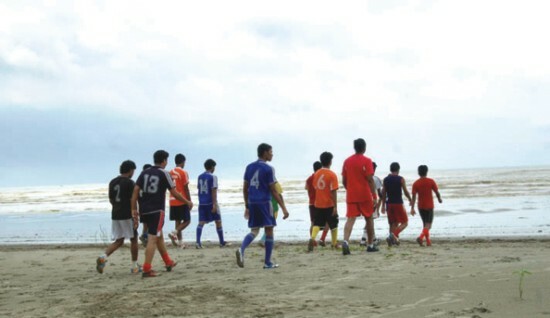 The boys dribble the football from one point of the abandoned beach in Inani to another, repeating the same motion almost half a dozen times as the cameraman films the shot in various different angles, until a disembodied voice cries out “cut” and the boys race for cover once again. Shamim (Ferdous) and Maya (Bindu) share a light moment. Jago, to be released on December 16, 2008, is the first film to be produced by Interspeed Production House. 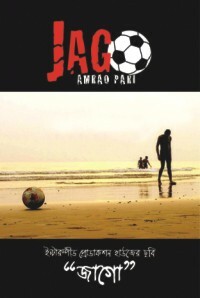 It is a story about a local small-town football club from Comilla -- their triumphs and their losses, their joys and sorrows, their inner and outer battles. It depicts the journey of the Azad Boys Football Club when they decide to challenge an international-standard team from a bordering country. The idea was first conceived by Khan about a year ago. Khan, a big fan of football, was inspired by both the story of the Shadhin Bangladesh Football team and by his three uncles who were freedom fighters during the Liberation War in 1971. This is Khan's second movie (his first being Osthithe Amar Desh released on March 26, 2007). However, the newcomer director was not always in the film industry. After graduating from Sylhet Cadet College in 1999, Khan studied economics in Hamlin College in Minnesota, USA. He worked for five-and-a-half years as a financial analyst and then came back to Bangladesh in 2006. “I've always been passionate about both film and football so I just kept thinking, why not give my passion a shot,” says Khan. “And something told me to come home because it is always easier to take risks in your own country than in another. Umama Nawroze Ittela is the film's Production Manager on behalf of Interspeed. Having worked in various organisations such as UNICEF and BCCP, she joined Interspeed in 2006. For her, Jago is not just a film about football. Aside from having an impressive cast, including TV serial actor Tarek Anam, film actor Ferdous and actress Bindu, the film can also boast of having very talented behind-the-scene people working towards making this project a success such as Music Director Ornob, and Director of Photography Rashed Zaman. Like Khan, Zaman's first calling was not in film. After finishing up at Mirzapur Cadet College, Zaman found himself studying architecture in Middle East Tech University (METU) in Turkey. After working as an architect he went to complete his Masters in architecture at University of California, Los Angeles (UCLA), where, after two weeks time, he decided to go to film school, simultaneously working as a camera assistant for various short films and independent films in Hollywood. He came back to Bangladesh in February of 2007, wanting to do something in his own country, and has worked on various films and advertisements. Jago is being shot in the HD (High Definition) format, rather than the standard 35mm format. Although many people prefer 35mm, Zaman says that there are advantages to both. The Azad Boys after a hard day of training. Zaman is also affiliated with post production company Bioscopewala, which is trying to promote the use of digital technology in film. Also on the Jago bandwagon, the company provides services such as production equipment rental and post production which includes anything ranging from editing and colour correction to sound engineering. This is the Bioscopewala's first commercial film from the time they formed in 2007. One thing is for sure – Jago has the potential to strike a chord in many people. Be it for the sole reason of supporting the underdogs, of believing in one's own country, in wanting to do what cannot be done, or even, to find redemption after all else seems lost, the story of Jago is, while not a new one, inspiring all the same.